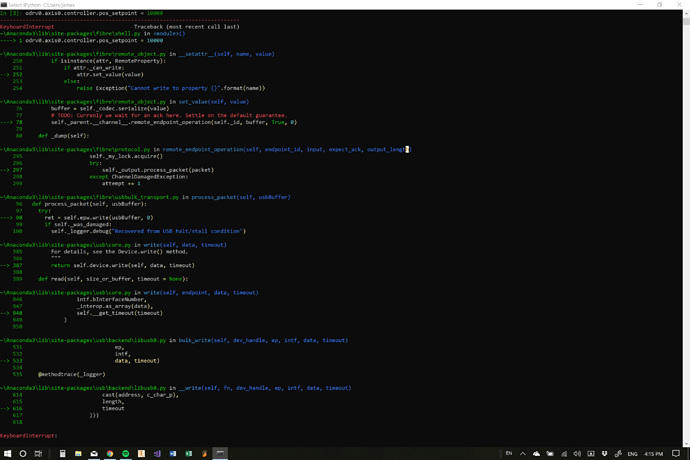 I have successfully calibrated my motor and encoder to use an index pulse through the odrivetool, but when i enter closed loop control the odrive stops responding to commands, If i change the control mode before i enter the state it changes its behaviour but if i try and change a set point for example the odrive doesn’t react or respond with any errors. I am using the AMT102 encoder and this is My Motor. 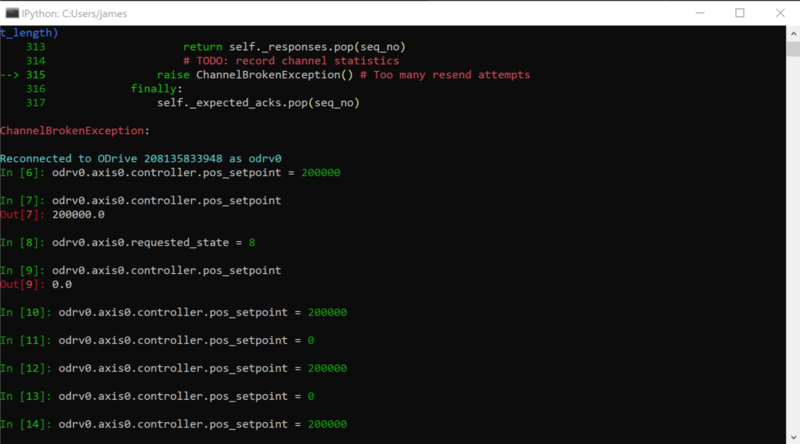 Hmm, so if you use hex(odrv0.axis0.error) do you get anything? 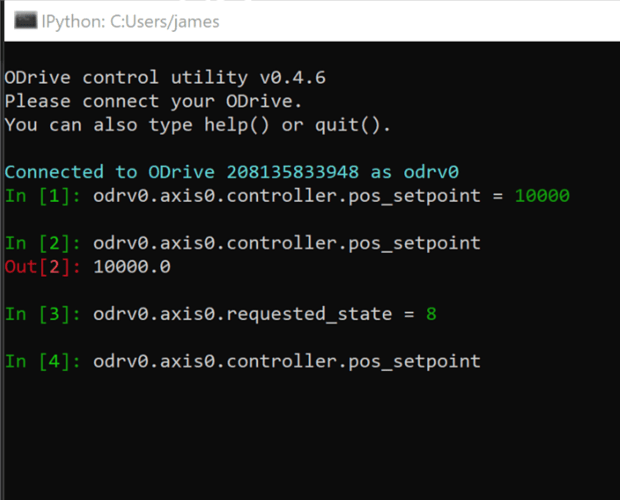 What about odrv0.axis0.current_state? 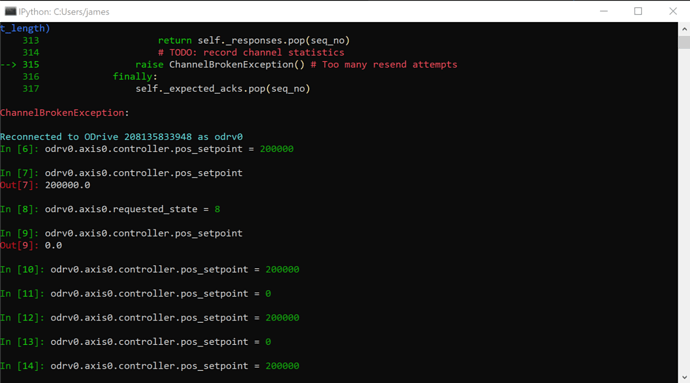 If i use hex(odrv0.axis0.error) before I put it into closed loop mode it returns 0x0 . If i use it after i get no response. 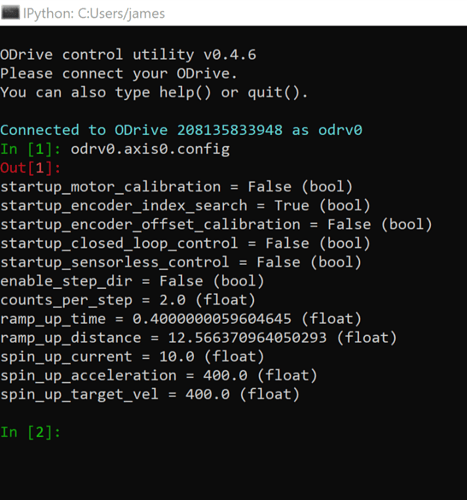 If use odrv0.axis0.current_state before i put it into closed loop mode it returns 1. If i use it after i got no response. Can you show us a screenshot of what it looks like when you don’t get a response? This is what it looks like when it freezes. It doesn’t allow me to input anything. I just tried again and for some reason I was able to move the motor a couple of times before it became unresponsive again! Very strange, i didn’t change any of the physical setup or any settings. As you can see i was able to move the motor back and forth 5 times before it became unresponsive again. FYI When the drive becomes unresponsive it still holds its position if i try and move the motor by hand. 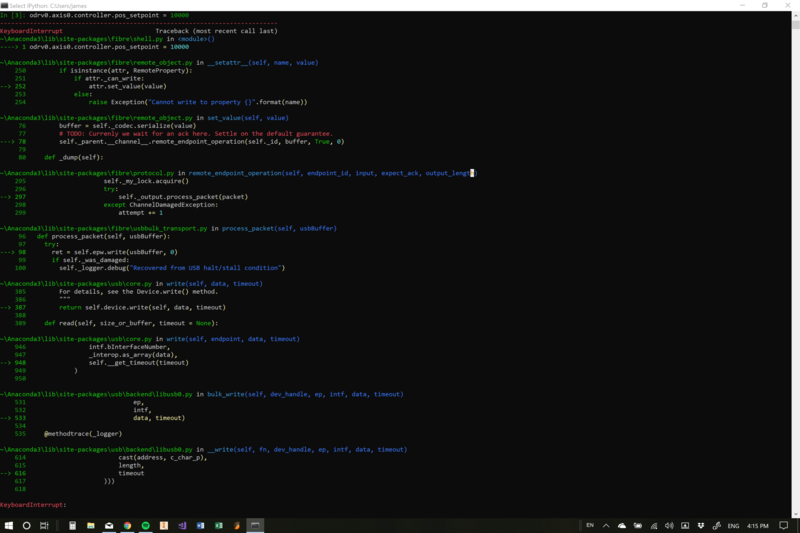 When it’s in the frozen state, can you do ctrl+c and then post a screenshot of the entire stacktrace? 77         # TODO: Currenly we wait for an ack here. Settle on the default guarantee. 385         For details, see the Device.write() method. Hm are you at all able to try connecting from a different PC? Hi! 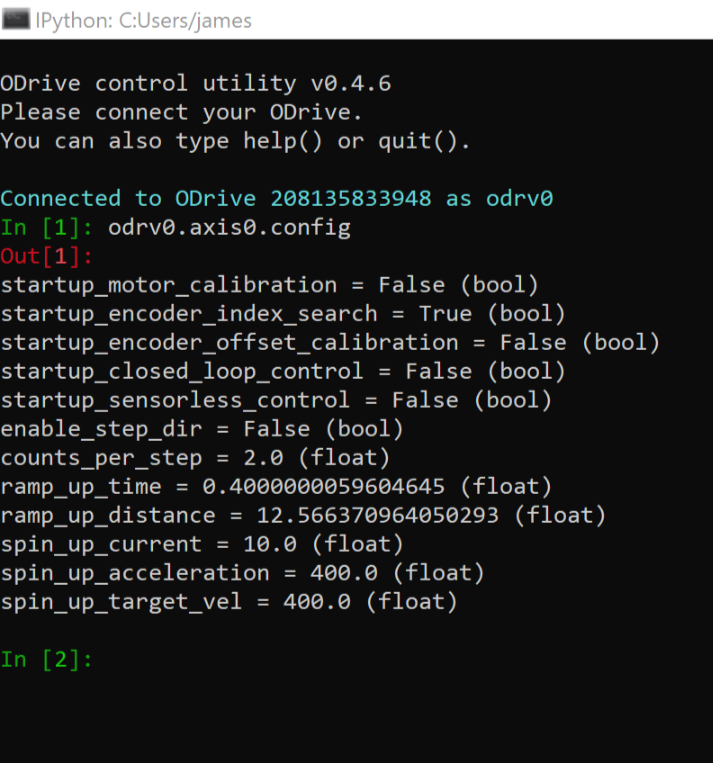 I’m having the same issue in both V0.4.7 and V0.4.5 of odrivetool and firmware. 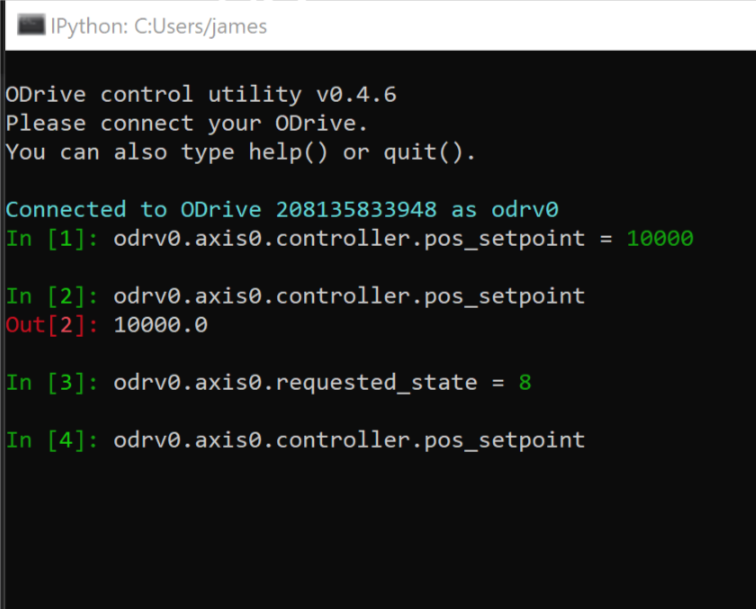 I’m running an ODrive v3.3 on Windows 10. I’ve also tried on a different PC with Windows 7 with the same results. This is repeatable for me in both cases, and only happens once closed loop mode has been entered. What happens if you set the startup_closed_loop_control flag to true before enabling the axis rather than setting the requested_state separately? Do you still get the unresponsive behavior? Sorry for the delay in answering: do you still have this problem?